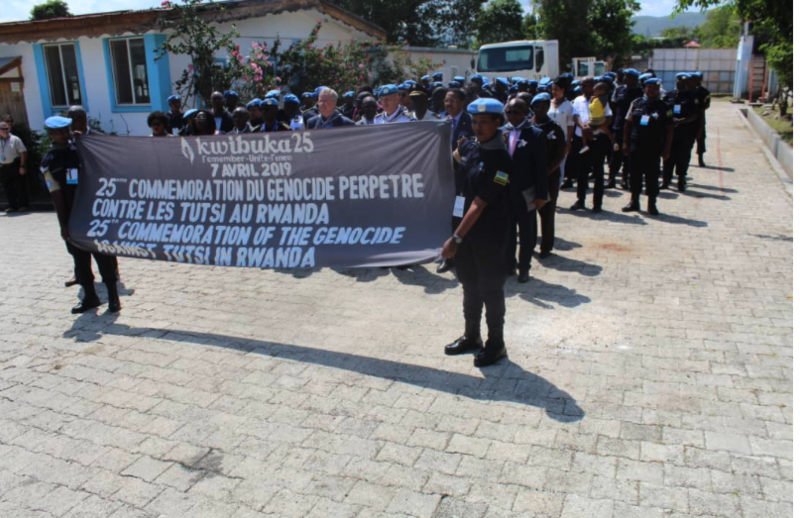 Rwandan Police peacekeepers in various UN missions, on April 8, held discussions on the history and the aftermath of the 1994 Genocide against the Tutsi as part of the activities to mark the 25th commemoration of the 1994 Genocide against the Tutsi. They discussed on the role of the previous leadership in planning the killings; role of security organs in preparation and execution and failure of the international community to prevent mass killings. They also discussed on their collective commitment and responsibility to prevent genocide from ever occurring again in any place of the world. The dialogue was also characterized by short video clips that highlight how the Genocide was prepared, planned and executed within a period of 100 days where over one million innocent Tutsi were brutally murdered. The blue berets were also joined by the Rwandan community in those countries as well as friends of Rwanda. Rwanda maintains about 1200 Police under the UN mission in CAR (MINUSCA), South Sudan (UNMISS), Haiti (MINUJUSTH), Abyei and Darfur.